YES you can sing with us . . .
You don't have to be an experienced singer to be one of us. Some of our members don't read music, others do; and we all learn together . . . in harmony. When you visit a Baton Rouge Chorus rehearsal, a member of our music team will help you find the best placement for your voice. Our singing parts are based on traditional barbershop voicing: Tenor, Lead, Baritone or Bass. From the beginning, you will be encouraged to sing with us, sheet music in hand! The ability to read music is NOT essential but is helpful. If you decide to become a member, we will do everything we can to help you make that happen! We ask those who wish to join to learn two songs.Those songs used can be found here Harmonize the World and How We Sang Today. The songs are typically sung at each rehearsal. The details of the process will be explained by Membership BUT you will not be asked to sing alone. The links include sheet music and learning media for each song. You will be partnered with a "Big Sister" for support. She will encourage and support your musical growth. She will be a source of information helping you seamlessly become a productive member of the Baton Rouge Chorus. Barbershop’s harmony features four voice parts which are called by their traditional names - tenor, lead, baritone and bass – whether referring to men's or women's vocal groups. One of the distinctive qualities of barbershop harmony is that the melody, sung by the lead voice, is below the tenor harmony. It’s possible that there could be “solos” in a performance but basically we sing together in four part harmony. 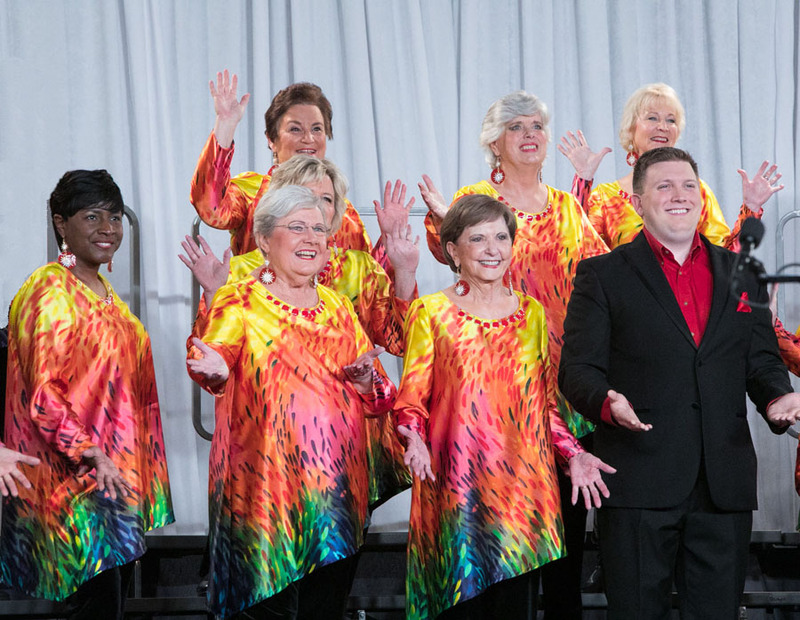 Sweet Adelines International is an educational organization as well as a performance group. As a member, you’ll find an almost unlimited number of opportunities to learn more about our art form, to take ownership of the organization and to help plan the programs we’ll follow. The organization provides superb vocal education and you will become one of almost 30,000 women who find friendship, sisterhood and harmony in this beautiful international women’s organization. It's incredibly fun -- and incredibly challenging! It's keeps you young, inspired and involved. It lets you indulge your "inner diva" and enjoy applause...while you work really hard to learn new skills. You'll make lifelong friends...and there's even evidence that it's good for your health. Science says so . . . Numerous studies have found that all types of singing have positive psychological effects. The act of singing releases endorphins, the brain's "feel good" chemicals. But of all the types of singing, it's choral singing that seems to have the most dramatic effects on people's lives. Choral singers need to concentrate on their music and technique throughout the singing process, and it's hard to worry about things like work or money or family problems when you're actively concentrating on something else. So choral singers tend to have a built-in "stress-free zone." Learning is also part of the process -- learning new songs, new harmonies, new methods of keeping tempo. Learning has long been known to keep brains active and fend off depression.